Showing results for tags 'chain of memories'. Countdown to Kingdom Hearts 3. VIII Days Left (Lea/Axel). Morning everyone! I hope y'all having a great morning! Today is another Countdown to Kingdom Hearts and this time it's Lea! 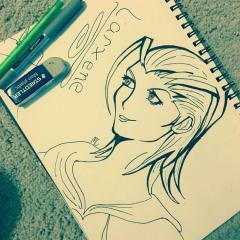 Like his Nobody Axel Lea will be taking the eighth day of my countdown. I can't wait to finally see him wield his Keyblade and see his interactions with Kairi. Plus, I wonder what kind of role he'll play. Only eight more days to find out! Ansem in KH Chain of Memories remixed to original music. (I will have reverse/rebirth uploaded after I finish the game hopefully by the 21st. Stay tuned!) --- So......I have mixed feelings about this title. I remember my mom got us the ps2 version of re:chain of memories. Because I was confused with the battle system at the time, I kinda gave up on it. It was only until I finally got back to kingdom Hearts in late 2015 after learning how important many of the games were in the narrative. So, I worked up the courage to try it out, and managed to play all the way through. This game, in case you don't know, has a card system (in order to swing a Keyblade or set some heartless on fire, you need cards). The gameplay is a mixed bag for many, it just really depends on who you are. Do you hate that it gets repetitive? Do you enjoy the fact that it makes you think on how you customize cards? I'll leave it up to you guys. I am somewhat in the middle myself. While I enjoy the gameplay just fine, it is not a system I would want to go back to in awhile. The biggest issues I had with the game is mostly the boss fights. What annoys me the most about the bosses is that a couple I fight I have to several times throughout the game (seriously, whenever I play this, I was never looking forward to fighting them). However, if there is one I actually enjoy is the final boss. I will leave it at that, but I'll say it is mainly because the design and aesthetics are just neat. As for what I liked about it, it was the story honestly. I think, out of the side games, this one is the most simple. Is it still convoluted in it's own way? Of course it is. 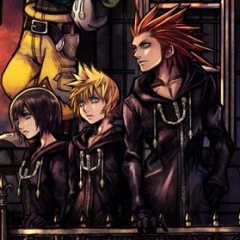 However, this shows Sora being at his most emotional out of all of the games in the series. I also felt the goal of the story is straight forward. Especially the fact it takes place in one location that has multiple floors. I even enjoy the villains residing in the castle. They are just incredibly entertaining to watch (at least a good handful while I the other half are just really annoying LOL). That being said, those are my thoughts on, at least, re:chain of memories. I like to point out, I only discovered this game after learning it was a direct sequel to KH1 when I played KH2. I did hear the chain of memories on the gameboy advance is a lot better, aesthetics and gameplay at least. However, that has yet to be seen when, one day, I'll be able to experience this myself. Till then, it's a B- for me. KH2 New deleted world found inside KINGDOM HEARTS II files. KH rookie confused, please help! I recently bought the Kingdom Hearts bundle "Kingdom Hearts HD 1.5 + 2.5 ReMIX" for the PS4. The reason i did, was because i previously (years back) played some of Kingdom Hearts 2, and thought it was a fun game, and would now like to try the entire series. I just completed KH1, which was an awesome game, and i'm now trying to move on within the franchise. Below i listed the way I have been told to play the games/movies (im not gonna buy a nintendo ds to play 358/2 days & Re:coded): 1) Kingdom Hearts Final Mix HD 2) Kingdom Hearts Re:Chain of Memories HD 3) Kingdom Hearts II Final Mix HD 4) Kingdom Hearts 358/2 Days (movie) 5) Kingdom Hearts Birth by Sleep Final Mix HD 6) Kingdom Hearts Re:coded (movie) 7) Kingdom Hearts 3D [Dream Drop Distance] Is this the correct way to go about it? If so, i am VERY confused, and have a couple of questions: 1. Since i just finished KH1, i shoud start playing RE:CoM right? But i heard I would get some bonus cards in that game, if I were to watch the 358/2 days movie first, how do i go about this? 2. As much as i enjoyed KH1 (and the mechanics of KH2 as well), i really struggle to understand the new mechanics of RE:CoM, do you have any tips to play this totally different game? Kind regards, Carsten. A simple picture I made! Keep in mind, I haven't done watercolors in YEARS. I never really worked with watercolor before that, either. So when I was told to work on a Kingdom Hearts watercolor as a challenge, you can tell I might have been a bit nervous/worried about the outcome. Besides, you guys know me, I do digital art, not watercolor! 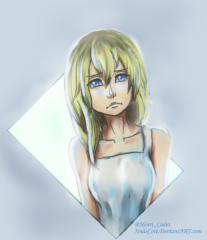 BUT...with time and dedication, I was actually able to work on it to a point where it came out wonderfully. I didn't finish the zipper or the pillars, sadly, and now I can't because the person who challenged me is no longer in contact. 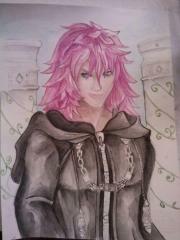 But I think it turned out great considering I have no real experience in watercolor. 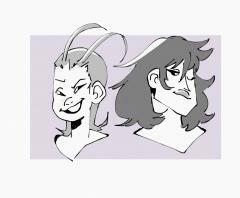 Every Spirit has a Doppelganger Nightmare counterpart, why would Riku be the exception to this rule? 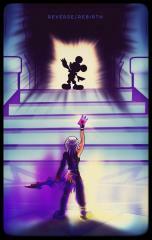 Replica Riku is Sora's nightmare. it makes even more sense considering Sora's concern of Riku being consumed by the darkness again and his negative experiences with Riku. 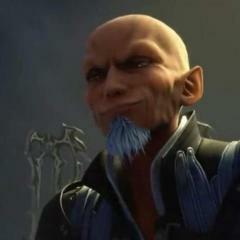 Plus, Ansem-Riku is a Xehanort when you really think about it... even Vexen's Doppelganger. 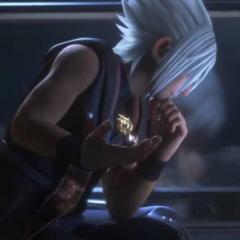 Riku Replica is literally a replica of Riku when he was Ansem-Riku. Xehanort could have recruited him as a Seeker of Darkness so that Riku Replica develops his identity beyond a "pathetic imitation". Why do people hate Chain of Memories? I never particularly understood people's reasoning for this. What is it about the card battle system in CoM that people hate so much? I absolutely adore it; it's a pleasant change of pace from the button mash-y action that was KH1. It required legitimate strategy and thinking; you can't mash X to win, because every attack you do has a cost to it that you must consider the repercussions to. Do people just not like it because it's not a button masher? And if that's the reason, does that mean these people dislike all games that aren't button mashers and require thinking?I really don't understand. People love games like Dark Souls, which forces you to fight cautiously and conservatively, which can almost be kind of compared to Chain of Memories' battle system. Yet the majority of the KH community that I've seen absolutely despises this game, and with no particular reason either. Can someone please tell me why? I really do want to know, because from what I can tell so far, it's just blind hate because the game is "different", and personally, I don't consider that as a valid reason at all.